I think I have messed up with my little Rebutia muscula. The little thing was flowering like crazy during the summer, and seemed to be happy in his spot on the window sill. However... he has grown long, twisty and spindly during the winter. I realise now that this is due to him searching for more light. The spot on the windowsill was ok in summer, but insufficient during winter. What to do? Do I just move him to a new (hopefully) sunnier spot, or is he too far gone now he's stretched into an S shape? Can he be cut or would that do more harm than good? 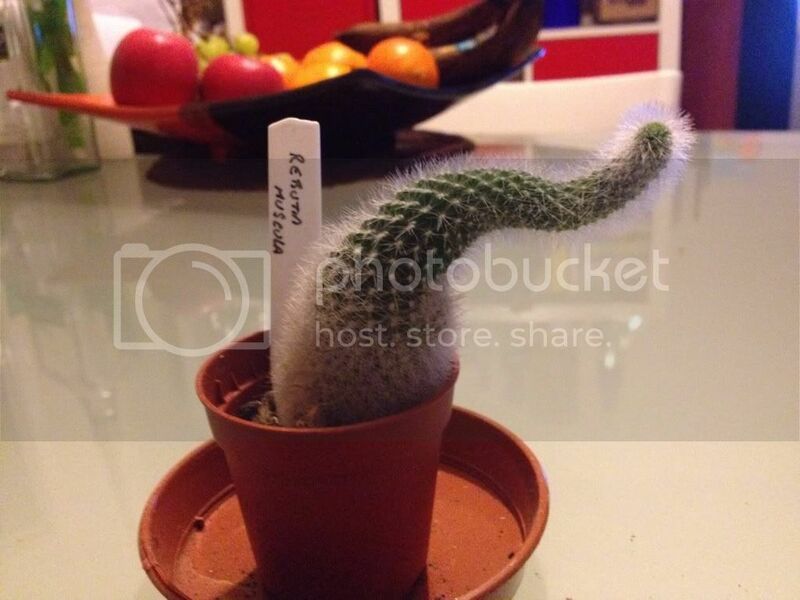 It's hard to tell what might be going on with your cactus, without a picture. If you'd like to post one for us, the instructions can be found here. I wouldn't cut it off, unless the plant has become truly ugly. If you do, you will always have a cut-off stem end showing, even though it might send out new growth from the other stems and the base. I would just accept it as the normal growth pattern of the species. In addition, if you cut it off, you'll have to wait for it to mature enough to bloom again. This is an image of the little guy. He kind of looks like a witches hat. There are some pictures online of similar growth in Rebutia muscula. I don't know if those are some kind of hybrids, or just a different variety than the more common one. It's also possible that the stem will fill out and broaden during the summer. Perhaps, when full watering is started again, it will swell up with water storage. I still wouldn't advise cutting back the stem, though. With cacti, when you cut a stem off, the top will never grow back. It will always be a dried cut end. I've done it in order to use the top to start a new cactus, but only when I was ready to throw the old one away ... either because it was dying, or got too large for the space I could allot to it, since my house is small. 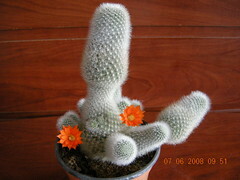 If you start a new cactus from the cut off top, it will have to grow and mature before it can produce flowers. That will take some time. I would wait and see what your little "witch's hat" does during the summer growing season, before taking any extreme measures with it. I would definitely be interested in seeing how things progress with this cactus, if you wouldn't mind posting occasional pictures of it. Thanks for the advice. I was reluctant to give the little guy the snip 'so to speak' but was worried if the growth pattern so far was a sign of something awry. I'll leave him be and see how he fares over the summer. I will post further pictures in the coming months. Thanks again for the help, it's much appreciated.